We ladies need protein! It’s funny how protein is most often associated with male health and fitness, when it’s actually essential for female health too. I have created a range of go-to high protein snacks for myself that I keep on hand every day. Protein in our food is used to make the amino acids that then go on to manufacture our hormones. So we need protein to make hormones. We need protein to be hormonally balanced and healthy – avoiding estrogen dominance and progesterone deficiency. I’m a big fan of snacking, as someone with insulin-resistant PCOS I know the importance of keeping my blood sugar levels in check and preventing insulin spikes. Regularly eating, including snacks, is vital for me to feel, and look good, and avoid all the potential symptoms of PCOS from depression to weight gain. Yes, even weight gain. Often when we’re looking to drop some pounds, we stop snacking, and this can have the opposite effect. 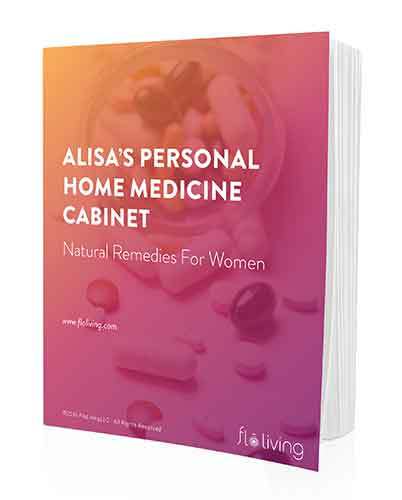 Nearly every women I work with through FLO Living has blood sugar issues that need addressing. High protein snacks are a super easy, simple way to make sure you’re getting enough protein for your hormones, and for keeping those hormones happy. We all need to use our food to stabilize our blood sugar throughout the day. Doing this will give you boosted energy, even moods, better focus and concentration, improved sleep, and bring down your stress levels! Importantly, eating the right kind of high protein snacks between your meals supports your body in making, processing and eliminating excess hormones – this biological effort and energy that might otherwise be routed to dealing with blood sugar mayhem. I recently came up with a fantastic protein smoothie recipe. I love this smoothie for after my workouts. 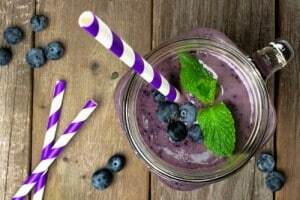 It includes: sacha inchi powder, moringa powder, spirulina, ginger, mangosteen, cinnamon, flax seed, a splash of almond milk, frozen blueberries and a drop of maple syrup or a date for sweetness. Give it a try and let me know what you think! Nut-based, raw, vegan desserts are so popular these days and there are some great recipes out there. My favorite is a raw, vegan, lemon tartlet – you can make smaller versions of this recipe for a snack. With desserts, always use the kind of sweetener that won’t spike your blood sugar, like coconut nectar or honey or a tiny amount of maple syrup. You never need as much sweetener as the recipe suggests either, I find. My new favorite protein bars are Amrita Health Bars which comes in flavors from chocolate maca to apple cinnamon. They are free of soy and gluten, non-GMO, and organic. The protein comes from brown rice, sunflower and sesame seeds – and added ingredients to the base, like maca. Eggs are the perfect protein for women. Despite the myths we’ve all heard, eggs do not cause high cholesterol – sugar does that. The high quality fat (you must eat both the yolk and the whites) in an egg actually protects you from heart health problems and makes it the most bio-available, easily convertible source of protein around. I love to make hard boiled eggs for an on-the-go snack. Sunflower butter is packed full of protein. Spread sunflower butter on apple slices or gluten free bread or crackers. I’ll often have sunflower seed butter on gluten free toast with my afternoon tea. If you’re working out at a gym or taking classes and on the run, you can always fill a water bottle half with almond milk and half with water, then add a good protein powder like sacha inchi to the mix. This will give you a quick source of easy protein. First, are you trying to lose weight? Second, do you suffer from mood swings? Hi! I as wondering about hummus. I eat a fair amount of it but usually with veggies or a few whole grain gf crackers. Thanks for this article. Always looking for protein ideas. I have a question about snacking because I’ve heard so many different things about it. I rarely snack because I just don’t feel like I need to. I also often don’t eat breakfast until about 9am and I’m up at 6am. I know I have low blood sugar so I try to remember to eat something within an hour of waking but I forget a lot. Do you think it’s still a good idea to snack between meals to keep blood sugar stable even if I’m not hungry and/or don’t need to snack? I feel like I would be forcing myself to eat. Are there crackers you recommend that are gluten-free and low carb? So may gluten-free crackers seem to be made with rice (or full of sodium), but your cracker and sunbutter snack sounds delicious. I’m a big fan of your blog Alisa! And I love these options, although my gallbladder is sooo sluggish and because of this I have an incredibly hard time digesting fats :/ (and does it ever show! my dry hair, brittle nails, keratosis pilaris, and dysmenorrhea BIG TIME!). I know for sure I have low stomach acid from bouts of stress and anxiety for several years – I’m prone to having that constant “stress belly” ugh. What would you suggest I work on first? I take bcomplex, canadian bitters before meals, and going to begin taking probiotics. Can you please include the quantities for each ingredient in this smoothie?